As per ISR scientific study and research, Lord Rama's birth date is calculated as 10th january 5114 BCE. They used a software named Planetorium, simulated arrangement of planets as per Valmiki Ramayana and determined that the same arrangement of planets existed in 5114 BCE. Also they validated all the incidents like Bharata's date of birth, Hanuman visiting Lanka to find Seeta that time Lunar Eclipse took place. All of these dates were validated and their research concluded that Rama existed in 5114 BC. 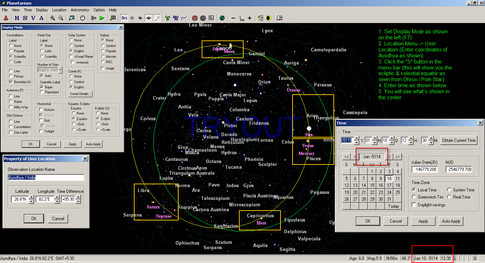 Following is the image of planets in Planetorium software when Rama took birth. Also they found the date of Mahabharata to be some 3000 BC. Current year is 2015. So 7000 years before now, Lord Rama existed and you can see the difference between Lord Rama (Treta-yuga) and Mahabharata (Dwapara-yuga) is only 2000 years scientifically. Then why Kaliyuga is lasting from 5000 years? Is this true as per Hinduism? Also, are locations or arrangments of planets mentioned for Kalki avatar's birth or pralaya in any other purana? If it is there, can we simulate in planetorium software and find out when Kalki will be born? Quora.com: When & Where was Lord Rama born and what evidence is there to substantiate this? 1) According to the Scientific dating conducted by many scholars, The Great War of Mahabharat between the Pandavas and the Kauravas happened in 3139 BC. The Pandavas, after winning the Mahabharat war, ruled Hastinapur for 36 years and 8 months until the beginning of kaliyug in 3102 BC. 2) Srimad Ramayana was written much earlier to Mahabharata. In the 272-289 Sections of Vana Parva of Mahabharata, the story of Sri Rama was narrated to Yuddhistara by Sage Markandeya. Though the story contains minor variations compared to the story told in the Srimad Ramayana, those episodes describe the story of Sri Rama in full. As the story of Sri Rama was narrated in full to Yuddhisthira in Mahabharata, we can safely conclude that Srimad Ramayana was written much earlier to Mahabharata. 3) The story of Srimad Ramayana ends with Sri Rama's coronation as the King of Kosala Kingdom. Sage Valmiki describes in the concluding chapter of Yuddha Kanda that having enjoyed the kingship for ten thousand years, Sri Rama performed a hundred horse-sacrifices. It was described very briefly about the happy life of the people of Kosala kingdom during the reign of Sri Rama. "All the people were endowed with excellent characteristics. All were engaged in virtue. Rama was engaged in the kingship thus **for Ten thousand years." 4) If we take 3102 BC as the basis for the Mahabharata dating, then at least 10,000 years are to be added, assuming that Mahabharata immediately followed Sri Rama, to 3102 BC for getting the age of Sri Rama. Thus, we will get 13,102 BC. That means atleast 15,000 years back Srimad Ramayana might have written. This was the available calculation. Not the answer you're looking for? Browse other questions tagged mahabharata ramayana history rama kalki . Were Vali and Sri Rama of same age?